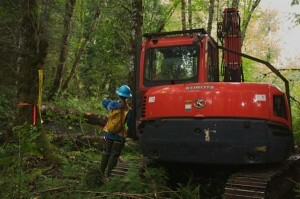 RAINIER, Ore. – Since the Oregon Forest Protection Act of 1971, when stream protection became law, restoration teams have been trying to repair habitat critical to native salmon and steelhead. 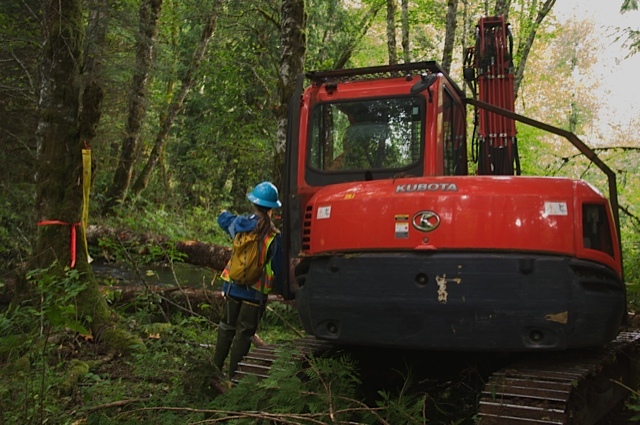 The project we captured in photos, took place at the headwaters of the Clatskanie River where it runs along Schaffer Road. 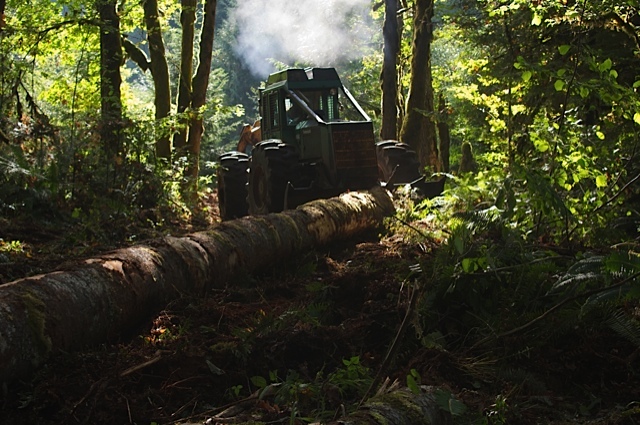 The players involved were the landowner (who provided the stream), the loggers (who provided the know-how, the equipment and the woody debris) and the watershed council (who partnered with the resource people who provided the engineering skills). Lower Columbia River County Watershed Council (LCRCW) for help. 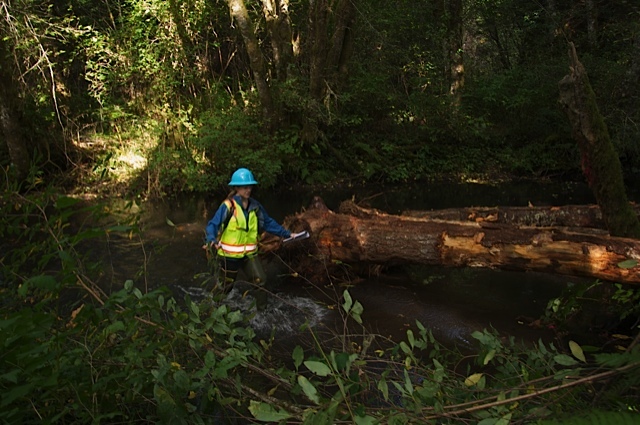 LCRWC applied and received a grant from the Oregon Watershed Enhancement Board (OWEB), which paved the way for the Natural Resource Conservation Service (NRCS) to assign Roslyn Gray, P.E., North Coast Basin engineer to design and implement it. The woody debris, included four mature maples, a cedar and some Douglas fir which the landowner felled on site. The root wads were brought in from VanNatta Brothers tree farm. Starting in 1949, the Oregon Fish Commission began to remove woody debris from streams to allow water to flow freely. The intent was to make better access for fish. Instead, streambeds were scoured to the point of ruining spawning habitat. Because the wood disappeared, the fish had no place to hide. Margaret Magruder, coordinator for LCRWC, is among those who are working toward turning those conditions around. Gray, who grew up in the Seattle area, graduated from Cornell University with an undergraduate degree in Civil and Environmental Engineering and a master’s in Environmental Fluid Mechanics and Hydrology, is happy to be back in the Pacific Northwest and thrilled to be doing this kind of work.